By far the most commonly asked question I get is: What project based learning topic should I start with? What are you and your students interested in? What authentic audience and expert speakers do you have locally? The more interested you and your students are in the topic, the more in-depth inquiry that will happen. The challenge is finding something that you, the teacher, is passionate about, that your students will love too! A good deal of your passion will rub off on your students. If you choose a topic that your students are into, but you have zero knowledge about it, you’re asking for trouble. The best starting point is what the teacher is passionate about. Make a list of topics you’re passionate about that relate to your standards. Once you have this list, move on to thinking about which topics your students would be most interested in. If you’re not sure, do a quick survey of your students. Take a look at your topic list and figure out which topics you have access to an authentic audience for. You might be really interested in creating a PBL related to aquariums, but the closest aquarium is 200 miles away. Now, if you have a friend that is a marine biologist that works at an aquarium and is willing to work with your class via Skype, you might be able to swing it. However, if there are zero resources for you to do this project, cross it off your list. For each topic on your list, identify an authentic audience that your students will create their final products for. Next, make a list of any guest speakers you can have come talk about the subject and help give feedback in your classroom. The last piece of choosing a topic is figuring out what tools and supplies you have available for it. By this point, you’ve probably narrowed it down to one or two choices. Answering this question just confirms that you have chosen a topic that you have the resources to actually complete in your class. What real-life tools can you use to make this topic come to life? Will students need to use technology? If so, do you have what they need available? Are there any tools you will need to get before beginning? If so, how will you obtain these? 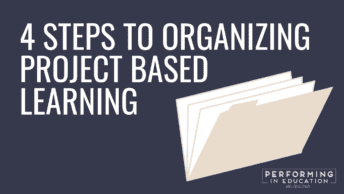 It’s important to remember that you can complete project based learning with little to no special tools. You don’t need a fancy 3D printer, even though that might be nice to have. See what you can obtain from businesses and parents that want to participate, before you start the PBL with your students. Need inspiration? Check out my book!